Pictured are some of Sean Forney’s works of art currently on display at Restoration Brew Worx, 25 N. Sandusky St., Delaware. 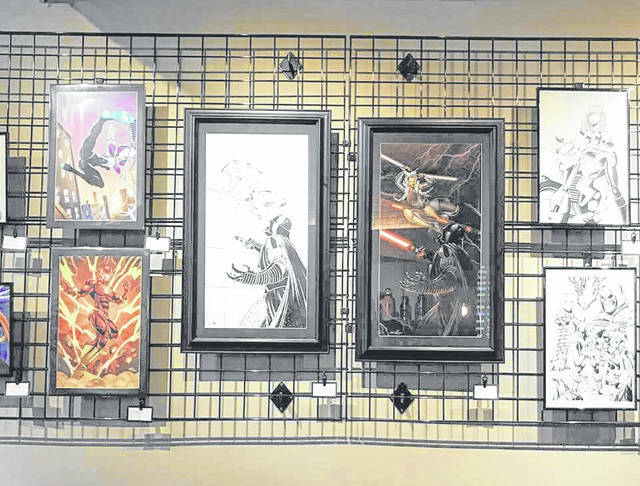 Throughout the month of January, Restoration Brew Worx in downtown Delaware will be showcasing the comic book style artwork of local artist Sean Forney. A Jan. 5 meet-and-greet kicked off the showcase, and patrons are invited to enjoy Forney’s artwork while dining at the eatery through the remainder of the month. Forney’s work features various characters in popular culture, as well as some of his own creations. His roots in drawing began humbly, drawing with crayons as a child and attempting to recreate what he would see during Saturday morning cartoons. Forney said it was in junior high that he first began thinking about the possibility of turning his talent into work. An avid comic book reader, Forney saw an article in Wizard Magazine that discussed how to break into the industry. Forney said an interview in the magazine with an artist, who began working with Marvel at 16 years old, particularly grabbed his attention and changed his perception of the industry. He said some of his biggest influences were Jim Lee, Joe Madureira, Michael Turner and Todd McFarlane. His favorite comic — and first comic he ever read — is Spider-Man. Since graduating from Bowling Green State University with a degree in fine arts, Forney’s talents have been displayed all around the country. His portfolio includes working on a licensed Spider-Man book, as well as with companies such as Marvel, Lego, Upper Deck, IDW, Zenoscope and Scholastic. Forney has traveled coast to coast, setting up shop in artist alley for a number of comic book conventions ranging from New York City and Boston, to the prestigious San Diego Comic-Con, which he has been a part of for the past three years. He referred to San Diego Comic-Con as the “Super Bowl” of comic conventions, and he fought for five years to obtain the highly-coveted spot in its artist alley. To add to the thrill of living out his dreams, Forney is able to work alongside his wife, Stephanie, who also graduated from BGSU with a degree in fine arts. She teaches digital imaging and computer graphics at Olentangy Orange High School. 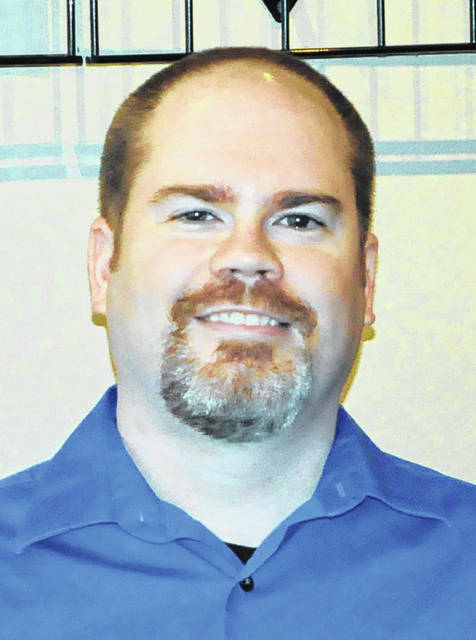 The two attend most every convention together, and Forney said she is the perfect compliment to him in helping in the areas that are outside his wheelhouse. “We’re very fortunate in that sense,” he said of being able to enjoy the experiences together. Currently, Forney is working on a new edition for his own creation — “Scarlet Huntress” — which he and his wife began while still in the dating stage shortly after graduating from college. He described the story as a modern-day take on “Little Red Riding Hood,” set in Columbus. He plans to crowdfund the book via Kickstarter, which he hopes to have up and running in March in time for the spring conventions. In addition to getting the next “Scarlet Huntress” book finished, Forney said he recently developed a mascot for Tire Discounters and is currently working with them on additional projects. As for what’s to come, he said he is always fine-tuning his portfolio in hopes of landing projects related to his childhood favorites. Asked what advice he may give to anyone who is interested in breaking into the industry, Forney said continuously honing your craft is essential, as is having an online presence, whether it be through social media or an online portfolio. Forney’s business cards accompany the art being showcased at Restoration. Anyone interested in purchasing an illustration may contact him via one of the many channels listed on the card. His entire portfolio can be viewed at www.seanforney.com. Restoration Brew Worx is located at 25 N. Sandusky St. Hours of operation are 11 a.m. to 10 p.m., Tuesday through Saturday, and 12-8 p.m. on Sunday. https://www.delgazette.com/wp-content/uploads/sites/40/2019/01/web1_Art.jpgPictured are some of Sean Forney’s works of art currently on display at Restoration Brew Worx, 25 N. Sandusky St., Delaware.